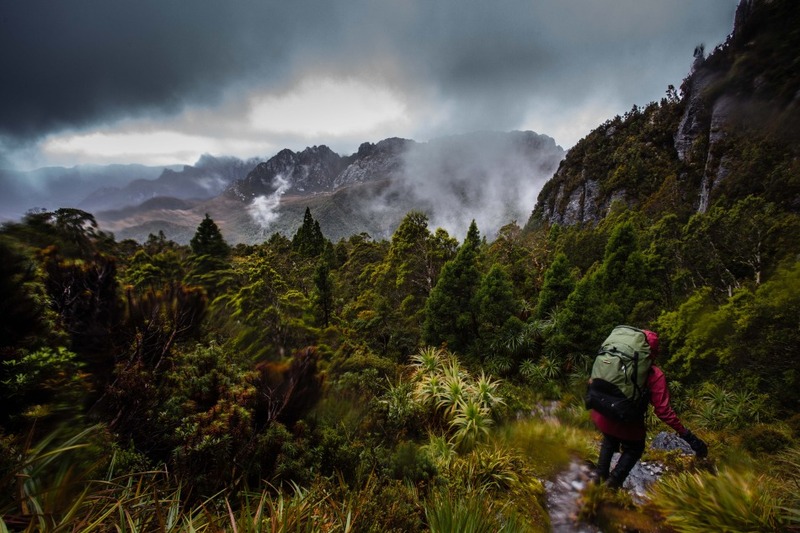 In the South West Wilderness, surrounded by kilometers of rain-forest, rising above the already impressive Western Arthur’s stands Federation Peak. Just like it has done for thousands of years. You can get to it. But you’re in for a hard slog. From the first time I saw it while flying to the start of the South Coast I knew I wanted to stand on it. An urge that grew the more I learnt. The fact that Edmund Hillary declared it the only mountain in Australia worth climbing, that half the people who attempt to climb it are turned back due to weather, or that it is known as one of the hardest walks in Australia. It’s a reputation that is well deserved. Getting to Federation peak was a hard slog. The track is steep, but you expect that from a mountain range. It’s muddy all the way up the ridgeline, but we knew that. There are guaranteed to be all types of rain/hail/storm/sweltering sun, all par for the course in Tasmania. There are long days, mosquitos and leaches but still nothing out of the ordinary. It’s still all standard operating procedure for Tasmania. What took the biggest toll was how overgrown the trail was. Kilometers and kilometers of ducking, weaving and hurdling. A marathon obstacle course. For our approach we were blessed with fantastic weather, the storm only setting in as we reached the base of Luckmans ridge. It came through in waves finally settling into a full thunder hail storm. We spent a cold night on campsites of the Arthur’s ridge line. That night I found the limit of my current camping equipment just before falling asleep. Looking around, I saw that everything from floor to ceiling were wet. Luckily my triple bagged sleeping bag was the last thing to stay dry. The next day we continued along Arthur’s ridgeline to Federation Peak. By then the hail had stopped but low clouds still stopped us from seeing down into the valleys but made for dramatic glimpses of the range. There ridgeline featured plenty of tricky sections though mercifully not overgrown. A break in the clouds on the way to Goon Moor Campsite. I mentioned earlier that only half the groups that reach the peak are able to complete the final summit. While weather is one of the main contributing factors, it is easy to see that exposure to height and difficulty in finding the correct rout also cause problems for groups. The final leg to Federation Peak is incredibly exposed. Simply by looking over your shoulder you can see straight down 600 meters to Cockroft lake. You are in fact looking down at the tallest cliff in Australia. It is suggested by most guidebooks that groups use ropes, but we were “relatively” comfortable soloing. Our choice was somewhat reinforced when returning from the summit. Another group was heading up planning to use ropes and harnesses. While they were arguably safer, they spent more time on the pinnacle and its exposed weather only barely making it back before sunset. It is possibly because of our success in summitting that I was not mentally prepared for the walk down. While it takes about two days to summit Federation Peak it is around the same time to come back down. But how hard can walking down a hill be? Well, so I thought. It’s a good reason to pay attention to the track notes. For the next two days we wound down and around the Mossmans ridge slogging through days of overgrown track. We couldn’t help but think that the reason for the trails being so overgrown is to keep walkers on easier tracks like the overland or even the South Coast. I certainly cannot think of many people who I would recommend this walk to outside a walking/mountaineering club. For a mountain that is only 90 km away from Hobart is surprisingly hard to get to. But if you like the idea of standing on top of the tallest cliff in Australia, surrounded by what can only be called a vast wilderness, then it is a hell of a walk.